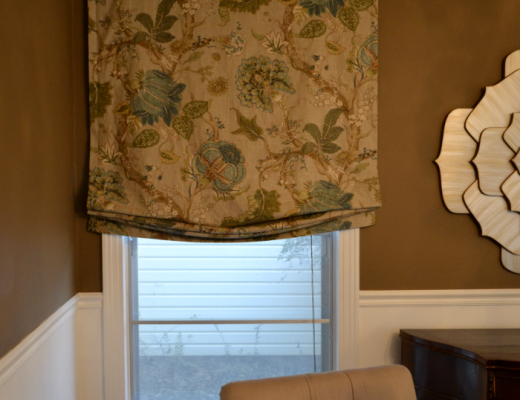 Reader Question:: Will This Window Shade Color Work With My Furniture? In my living room, I have dark wood floors as well as chocolate brown furniture with alternating tan and brown cushions and pillows. I have two accent ottomans that are brownish but have a bunch of circles on them in tan, light blue and chocolate brown. I recently purchased muted gold colored honeycomb shades for three narrow floor to ceiling windows in this room. I liked them because they are light filtering shades and in the sun, it had a nice yellow glow. Here’s the problem: Does yellow match with brown? Will these shades stand out too much in my place? How do I incorporate this new color into the space without it “standing out” too much? FYI: I have not painted the walls yet. They are white. If the color of the shades is a subtle, light gold, I really think you can make it work. A light, subtle gold can work beautifully with brown and light blue, as long as you use it correctly! The key to introducing a new color like that in a room is that you absolutely have to make it look intentional. Don’t just limit the color to the new item in the room. Spread the color around! Carry it to at least three items in the room, located in different areas of the room. If it’s on your windows, then add it to your sofa with throw pillows. Pick up a decorative vase in that color and put it in another area of the room. Perhaps use an area rug that has some of that color in it. Find a piece of artwork with some light gold in it. Spread it around, balance the color throughout the room, and make it look intentional. Now one thing you mentioned in your comment below is that you’re not planning on using anything else on the windows. I haven’t seen the windows, and perhaps you have a special situation that prevents other window treatments from being added. 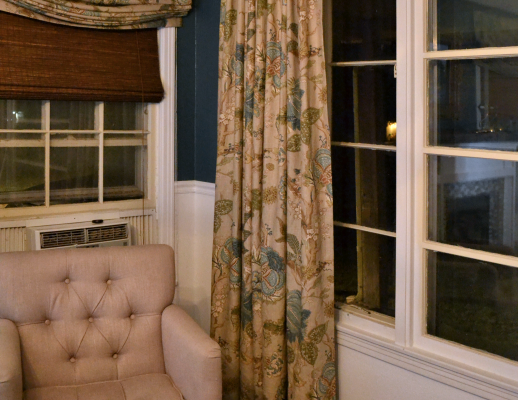 However, if you can, I would definitely recommend adding some FABRIC to your windows–draperies if possible. They make such a huge difference in a room, and without them, you’re missing out on a great opportunity to bring in a fabric that can tie together all of the colors in your room. What do you say? Can you help out Rebecca? Don’t be shy! Give her your input! Psstt…Have a decorating dilemma? Click here to submit your question. Out of Curiosity: Short Drapes?